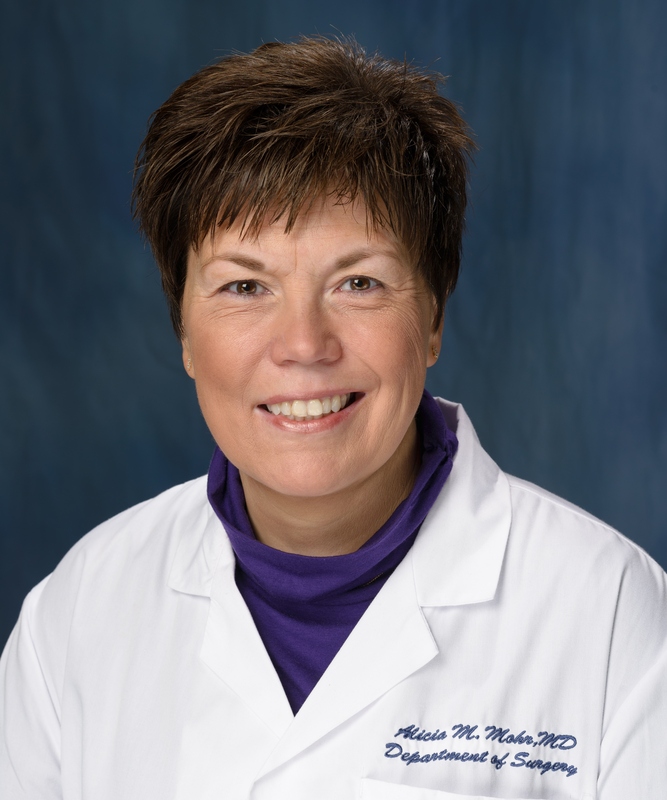 Alicia Mohr, M.D., FACS, FCC, is an associate professor in the division of acute care surgery in the University of Florida College of Medicine. Before joining UF faculty in 2014, she spent 14 years as an associate professor of surgery in the division of trauma/critical care at Rutgers New Jersey Medical School. Dr. Mohr performs basic and translational research. She is currently examining the impact of chronic stress following injury and shock on erythropoiesis. She examines the direct correlation between the magnitude and duration of the stress response that is seen following severe traumatic injury and resultant erythropoietic dysfunction. Dr. Mohr is an NIH-funded investigator. She was the recipient of a NIH K08 mentored research grant and simultaneously awarded the American Association for the Surgery of Trauma/American College of Surgeons Clowes research award. She successfully transitioned her NIH K08 grant to an R01 grant and has been funded since 2007. Dose-dependent effects of catecholamines on erythropoiesis. Early publications investigated the differential regulation of hypoxia on bone marrow cytokine production. These initial studies provided an impetus to study the role of a hypercatecholamine state on erythropoiesis. These studies demonstrated that catecholamines, particularly norepinephrine, had a dose-dependent impact on erythropoiesis. Both in vitro and in vivo, a severe hypercatecholamine state was associated with bone marrow erythroid growth suppression and anemia. Use of beta blockade to improve bone marrow dysfunction following trauma. Based on previous effects of a hypercatecholamine state, the role of beta blockade and the potential alleviation of bone marrow dysfunction after severe injury was evaluated. The beneficial effects of beta blockade appear to be mediated through beta-2 and beta-3 adrenergic receptors and beta blockade restored erythropoietic progenitor cell growth and reduced hematopoietic progenitor cell mobilization. These basic science findings were translated to the bedside demonstrating that elevated granulocyte stimulating factor was associated with shock and prolonged hematopoietic cell mobilization and that propranolol use early after trauma can improve bone marrow dysfunction. Persistent injury-associated anemia and the hypercatecholamine state. In response to a strong need to understand and develop alternative strategies for the treatment of injury-associated persistent anemia, Dr. Mohr’s current research utilizes a paradigm of a prolonged hypercatecholamine state that follows severe traumatic injury and hemorrhagic shock to further analyze the mechanisms involved in bone marrow hematopoietic dysfunction. This unique model of lung contusion, hemorrhagic shock and chronic stress has been shown to recreate persistent anemia after trauma. Both propranolol and clonidine have been utilized to reduce hematopoietic progenitor cell mobilization, improve bone marrow erythroid colony growth and anemia. In addition, Dr. Mohr actively collaborates with faculty in her own division, as well as faculty in the UF Institute of Aging. She is a co-investigator for an NIH-funded P50 center grant for the UF Sepsis and Critical Illness Research Center (http://scirc.med.ufl.edu/) to study the persistent inflammation, immunosuppression and catabolism syndrome, also known as PICS,PICS) following sepsis in surgical intensive care unit patients. Dr. Mohr has more than 80 peer-reviewed publications and has authored multiple book chapters and maintains a strong clinical presence. She is currently program director of the surgical critical care Fellowship, as well as newly approved acute care surgery fellowship. She is an advanced trauma life support instructor and an Advanced Surgical Skills for Exposure in Trauma instructor. She participates in committees in several surgical societies currently serves on the editorial board for the Journal of Trauma and Acute Care Surgery.